I love psychological thrillers that keep you wondering until the end. The interesting thing about this book is that the mystery is solved before the ending, but the story keeps going. I was a little put off by the story after the big unveiling, but while it was a bit odd, it put the rest of the story into perspective. This is definitely a book that will keep you wondering what the heck is going on almost the entire way. Imagine going to work like any other day, but coming home to find your entire life has changed. Your boyfriend or girlfriend is gone, and your home looks as though they never existed at all. Every piece of his or her life has been erased. The house looks like it did before they moved in, with only your material items making up the decor. When you check your phone, the contact for your partner is gone. All the pictures are gone. They’ve been erased from your social media pages. The phone number is no longer in service. It’s as if that person never existed. Hannah Monroe is living through these moments as Gone Without a Trace opens. Matt, her boyfriend has disappeared. He even has left his job and his mother has moved. There is no trace of him anywhere. Hannah goes from a woman dedicated to her job and ready for promotion to a woman obsessed with finding the love of her life. Her work life crumbles, and instead of a promotion, her job is in jeopardy. Her days and nights are filled with attempting to solve the mystery of Matt’s whereabouts. While her parents and coworkers question her sudden socal nosedive, she keeps the shameful secret of her broken lovelife between her and her best friends. While she struggles with her amateur sleuthing, mystery calls, text messages, and flowers haunt her every move. What is going on? The mystery deepens as she seemingly gets closer to uncovering the truth. Where will the next clue take her? Gone Without a Trace is one of those books that will keep you up at night reading. It’s not that it’s scary. The mystery and intrigue will make you want to rush to the end. Throughout the time you’re reading, images of nefarious plots run through your head. The author leads us down a path with just enough crumbs to make it worth the trip. In the end, she surprises us all. As far as characters go, Hannah starts off as a sympathetic character, but as the story progresses, she becomes more pathetic. Most of the characters are hard to like. While they read like real people, they are definitely not the type of people I would hang around with. I think this shows what a spectacular job Torjussen did with her development of her characters. Any emotional response other than apathy is a win. As an author you want your readers to react to the people you’ve created, even if it is dislike. To not care is not a good thing. Thankfully, Torjussen gets us to respond. There are points in the novel that you really feel bad for Hannah, but she slowly erodes the reader’s confidence in her. By the last page, she is so despised that you can’t believe she is the same character. That progression from proto-Hannah to new Hannah is the driving force behind the mystery surrounding Matt’s disappearance. It is simply spectacular. 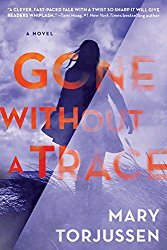 Gone Without a Trace is not Mary Torjussen’s first book, but it is the first book she’s written that has widespread marketing. Her earlier books were self-published and are not available yet. However, with the popularity of this book, I’m sure those earlier book will soon be making an appearance. I eagerly await their arrivals. Craig Bacon used to have girlfriends who probably wished they could disappear like Matt.